How time flies! 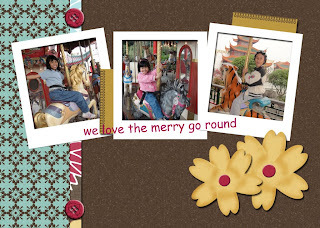 2009 is zooming past us and very soon it is the time of the year again to celebrate as we usher in the New Year. Have you already decided where to go for countdown celebration tomorrow night? No matter where you go or even if you had planned to spend the last evening at home, I hope you will have a wonderful time with your family. Before I end this post, I leave you with some of the photos taken during our trip to China last month. Moments before boarding the plane. 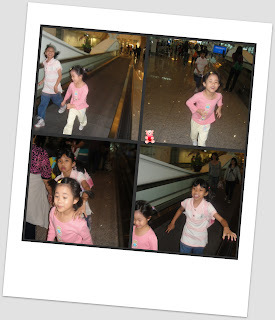 The 2 girls had fun running back and forth the travelator. I've lost count the number of times they went on the travelator. The girls were seated together and I was just next to Jasmine. Sharlene was rather excited after boarding the plane. She kept turning to the back and chat with daddy who was sitting behind her. They even brought their old maid and donkey cards along and insisted that I play with them. We played a few rounds and stopped just before their dinner sets arrive. Sharlene didn't like the food, she only took the snack. It was pretty chill during the first 2 nights. I’d to constantly remind Sharlene to zip up her coat and put on her gloves. This gal liked to remove her coat and kept saying she's not feeling cold. 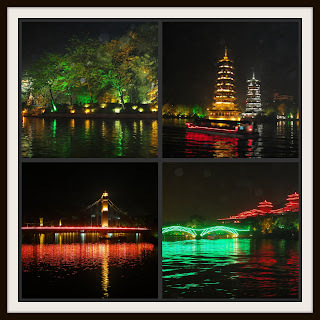 The different night scenes in Guilin. Mountains and river in Yangshuo. The gals with their new friend, Ivy. She is a year older than Jasmine. 3 of them were seen together most of the time. Once again, wishing all of you a Happy and Prosperous 2010!! Hello everyone!! It has been almost a month since my last post here. Hope you guys have not forgotten about me and my little girl ;) Thanks to those of you who dropped by and left your comments while I was away. => After much thought, we finally decided to visit China together with sil and family, hubs’ aunty who’s 75 years old and her eldest daughter. 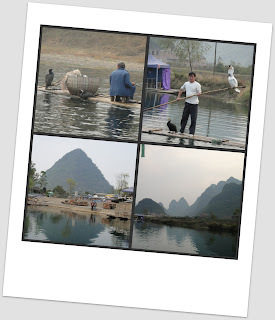 We visited Nanning, Guilin and Yangshuo during the first week of school holidays (22 – 29 November 2009). The trip was so-so only, very hectic and tiring especially for young kids and the elderly, not much time for shopping and the food…. hmm, quite okay although it was a tad oily. We were served with almost the same food everyday...fed up or not, you say? Sharlene didn't consume much, she survived mainly on her milk! She was downed with fever on the 5th day and vomited twice. Once in the bus and the other time in a room whilst we were listening to someone yakking about certain product. Thank god, she was back to normal after 2 days. 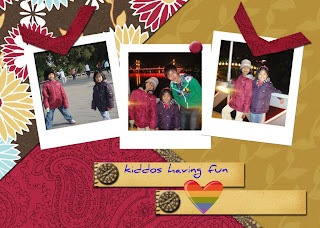 => The week after we came back, all of us (the 8 adults) fell ill with bouts of diarrhoea, vomiting and runny nose. Both hubs and I only had diarrhoea which lasted for a couple of days. The 3 kids were spared. => I started playing various FB games a few months back and it has becomes my addiction ever since. I’m sure to log on to FB to check on my farm, restaurant, café and fish tanks the moment I’m in front of the pc. This addiction of mine has left me with very little time to update my blog. As a result, I’m beginning to lose momentum in blogging. Nevertheless, I will still update my blog from time to time. At one time she disliked all these hair accessories and refused to let me put on for her but she's so different these days. A closer look at her creation. I will surely freak out if she wants to go out like this. Sharlene had her first experience with water colour about 2 months ago. Bought her the necessary stuff i.e. a box of watercolour, an art block and a palette to get our project started. I found some old paint brushes at home, so she just used that to paint. Straw painting, which was pretty easy for kids. Just get them to aim the straw at the paint and blow! However, Sharlene still needs my assistance from time to time and usually when she’s out of breath. Hmm...not that simple after all. I gave her the idea and with my help she completed this under the sea theme. The little fishes were done via finger painting. But it doesn't look quite like fish though. And here's her creation of an orange tree with some black birds on top of it. Sharlene loves to eat fresh cucumber. Give her a plate of sliced cucumber, she would happily munch down all of them. But recently, she has found a new way of eating her cucumber. That is to add some salad dressing on top of it. Ever since she saw us dipping our vegetables on thousand island dressing, she has been requesting for this sauce to be added on her cucumber. She's no longer interested in this plate of 'bland' sliced cucumber. Now she likes it this way i.e. drizzle with lots and lots of thousand island dressing. Whenever she wants to be ‘Little Red Riding Hood’ (usually after reading to her the story before bedtime), she would fish out her jacket from the cabinet, put it on and after that carry my bag and walk into the bathroom. At the same time, she would tell me to lie down on the bed and pretend to be her unwell grandmother whom she’s suppose to visit. She would start her play when I’m ready on the bed by walking out from the bathroom and then pretend feeding me with 'food' that she has in her bag. I do enjoy the fun moments with her but sometimes she would go on and on with it until I have to say ENOUGH, LET’S GO TO BED NOW!! Kids, they just don’t get bored doing the same thing over and over again. Sweetie, today is your 5 T H B I R T H D A Y ! ! Daddy & mummy LOVE you very, very much!! Welcome to my blog. I'm a full time working mum in my early thirties. 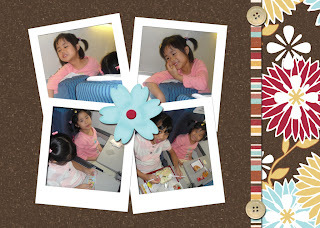 I have a cute little girl, Sharlene who is a food monster and a very loving and patient hubby. This journal is mainly about my daughter and also a little bit of this and that about my life as a mummy. More random bakes and cookings…. here comes the Big Bad Wolfie!